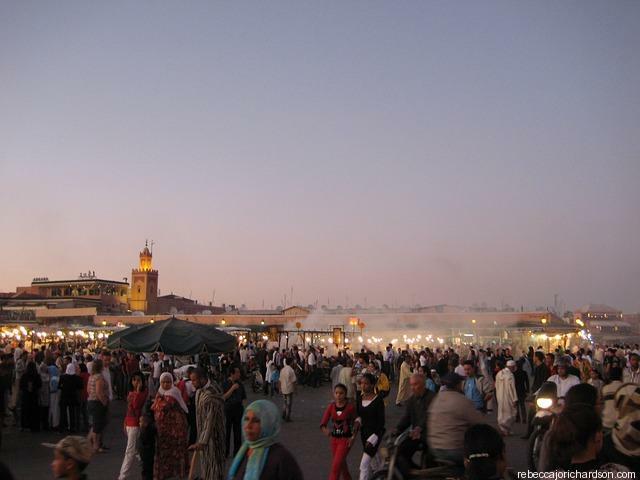 For me, there has always been something magical about a city like Marrakech. When I arranged my trip to Marrakech I decided to book a well known hotel, it was my first trip to Morocco and I wasn’t sure what to expect. I wanted to have a comfortable, safe place to stay and the Sofitel was absolutely beautiful. It was a short journey by taxi from the airport and was located very close to Jemaa el-Fnaa which is where I really wanted to spend all of my time. There was also a great pool and my room had a huge terrace which was just perfect for relaxing in the sun. Since I’ve visited Marrakech I now also know there are some wonderful riads that you can stay in too. These are Moroccan style houses that have been converted into guest houses and are decorated with stunning traditional designs. Perhaps if I get the chance to go back I’d try one of those out next time. The first thing that I loved about Morocco was the traditional Moroccan Tea. I had honestly never tasted anything so good. It’s a mint tea made with a lot of sugar so it’s perfect that they serve it to you on arrival at the hotel after you’ve been travelling and you’re in need of an energy boost! I could not get enough of this tea, I was drinking a few pots a day and the best thing is, it’s served everywhere! 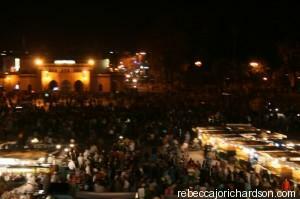 The most magical part of Marrakech for me is Jemaa el-Fnaa. This square, which is one of the most famous places to visit, is incredible. I arrived here the first time by taxi from my hotel and when I stepped out of the car and into the bustling street I was in shock! What I saw was a place in history. There were snake charmers, there were men telling stories surrounded by a circle of curious listeners, there were men playing music, they were beggers and there were a hundred guides trying to grab my attention! I didn’t know where to look. At first, the guides were quite friendly, offering to walk with me, take me to the best shops and restaurants etc but when I told them I didn’t need their assistance they would get a little aggressive, sometimes grabbing my hand and telling me I needed them and that they would save me from the other guides! In this situation you have to be strong. Simply tell them “NO” and keep walking. When they finally realise that they will not get paid they will move on. It is scary at first I admit, but, as with any new place you have to be prepared for some unexpected or unwanted attention! I went straight to see the snake charmers. I find this so enchanting, to watch a man charm a snake in and out of a basket, it’s something I had only read about in the past so to watch it was amazing. Naturally, after watching the show, the snake charmer immediately picked up the snake and placed it around my neck. 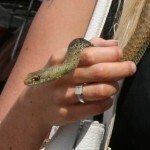 Fortunately, I’m not afraid of snakes, if you are, I suggest you don’t get too close! I was happy to hold the snake and the snake charmer was happy to pose for photos too, but, of course, there is a cost attached! The second you take the snake, you are accepting that you will pay something for the pleasure. Now, I don’t mind to pay as this is their business, they may be carrying out old traditions, however, they also need to make a living. The difficult part is agreeing how much to pay. He started telling me to pay £40, for taking a photo with my own camera, crazy! We negotiated, quite a lot, and finally I paid £6, still quite a high price, but I wanted to move on and was tired of the negotiation by this stage! 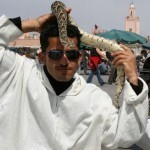 Anyway, I was happy, I had got my photos and enjoyed the magic of snake charming. 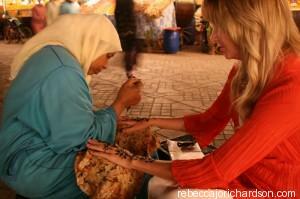 Next I found a lady to paint my hands with some traditional Henna. She was fantastic and drew the amazing designs so quickly. While waiting for my Henna to dry I walked around the square some more taking in all of the colours, the smells and listening to the music and story tellers. I wish I could explain it better but even I’m lost for words, there really isn’t another place quite like it that I’ve found. I love to shop in interesting places and as far as I’m concerned, you cannot get more interesting than an old Souk in Marrakech. Simply fascinating! 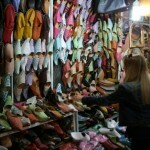 Morocco is famous for it’s production of leather and the beautiful Moroccan lamps. These, of course, were the first things I needed to buy! It didn’t take long for the shopping to begin! 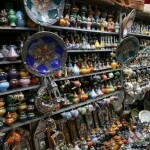 Every shop is like a little Aladdin’s cave, full of trinkets and treasures. Everything seems to sparkle with a little bit of mystery. When you enter a shop, don’t expect to leave quickly, the owner will offer you to sit down and drink some tea (I enjoyed this!) while he shows you all of the wonders you can buy. The prices will start very high but don’t be put off, it’s normal to negotiate a lot! If he says USD100, offer him USD1, you will probably end up paying no more than USD8! It’s a little bit tiring but, you just have to enjoy the moment and keep in mind the price you want to pay! Another thing you will notice is that the leather has a very strange smell, it’s to do with how it is treated in production. The smell of the bags and shoes worried me as I wasn’t sure I would want to use them but they assured me that it will fade in time, and true enough, after a week or 2 the smell was gone! The famous Majorelle Garden garden is a must see. The colours are incredible and the museum of Islamic Art is stunning. 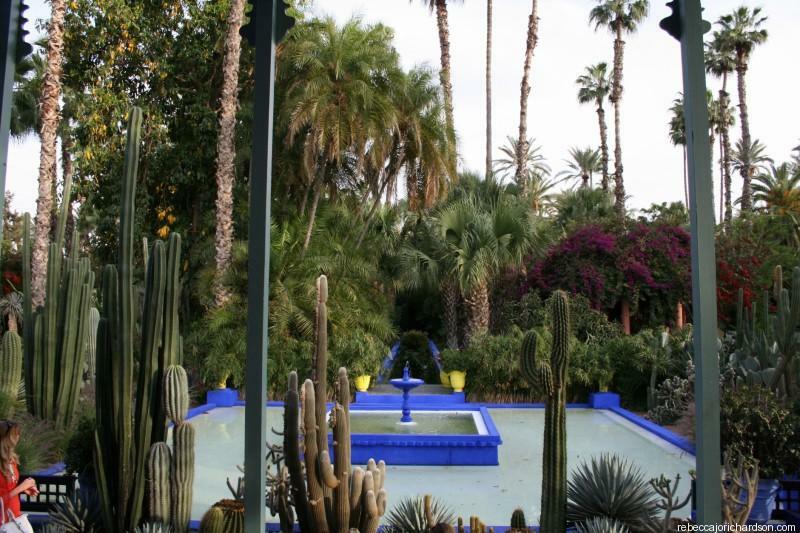 The garden was created by Jacques Majorelle and was later purchased and restored by Yves Saint Laurent who heard that it would be closed and the land used for a hotel. It really is an oasis and such a difference from the hustle of the busy square which is just a few minutes away! Perfect for an afternoon walk and great for a fan of photography as it’s so beautiful. I hope you have enjoyed my quick tour of Marrakech and that maybe it has inspired you to visit this wonderful city.